Toyota has doled out serious updates for its 2019 TRD Pro family. Specifically for the 2019 4Runner TRD Pro, this has resulted in a healthy price jump compared to the outgoing model. If you’re interested in the newest version, you’ll need to bring an extra $3,340 to the table in order to bring one home. For the 2018 model year, Toyota posted a starting price of $44,120 for a 4Runner TRD Pro. First reported by Cars Direct, you’ll find that the price jumps to $47,460 for the 2019 version, and both figures include the $1,045 destination fee. All of the other trims in the 4Runner lineup are sliding up the price scale by $100. Speaking to Toyota directly, the automaker has confirmed the upward move in the asking price. So what are you getting for all of that extra cash? A fair bit, actually, as Toyota have completely reworked the suspension in the TRD Pro lineup. Gone are the Bilstein units that Toyota have used for a number of years. In their place you’ll find Fox suspension that come packing 2.5-inch internal bypass shocks paired with TRD front springs up front. Out back it’s a similar setup, with 2.0-inch reservoirs and loads of damping to keep the truck, well, trucking. A set of matte black 17-inch alloy wheels, an updated skid plate, and beefy Nitto tires help round out both the style and performance upgrades found on the 4Runner TRD Pro. For 2019, Toyota will offer the off-road SUV in a choice of three colors. You can go with Super White, Midnight Black Metallic, or Voodoo Blue. That last one is only available on the TRD Pro version of the truck. Will buyers be flummoxed by the jump in price? We don’t think so. 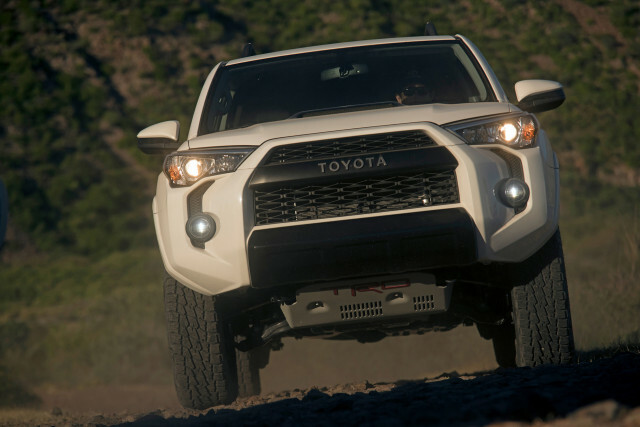 A TRD Pro buyer knows what they want, and Toyota has sweetened the off-road package. Adding a few grand to the bottom line shouldn’t change that to those laser focused on putting TRD Pro’s latest and greatest offerings in their driveway. And then flinging them down their favorite trails and returning to that driveway covered in mud and dirt.